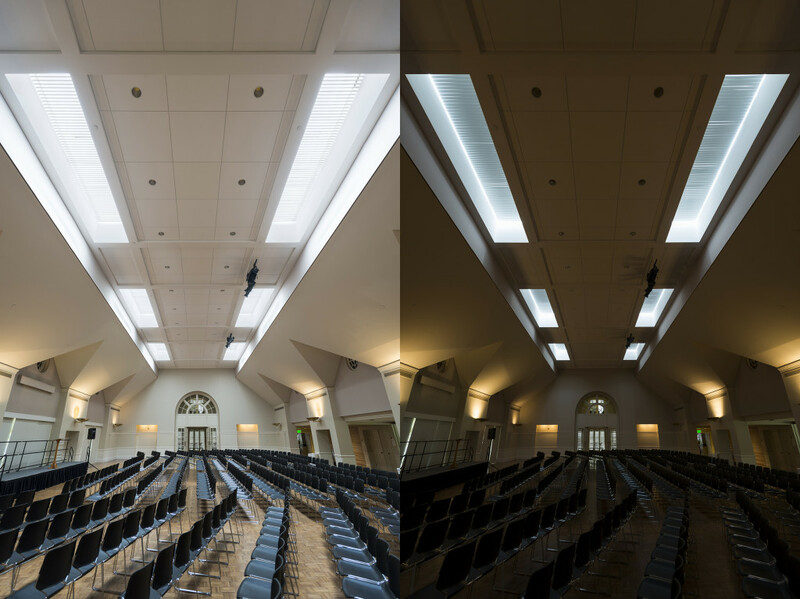 Interior roller window shades are great for solar control in Houses of Worship —especially with issues like glare—but sometimes a different solar control solution is necessary. Take, for instance, the First Presbyterian Church of Houston, Texas. The church’s fellowship hall is a multi-purpose space with skylights. There is the need to sometimes have the natural light, but keep it controlled or blocked at other times. One solution would have been a Draper SkyLight FlexShade, but in this case the architect decided to go another direction and utilize the FlexLouver Rack Arm System. The rack arm system consists of opaque aluminum painted slats which can be closed to a “brown-out” position or opened to various angles to allow direct daylighting. Hole says the FlexLouver at Houston FPC is a motorized system tied in to the existing electrical circuit and operated by a wall switch, so the system can be closed or adjusted with ease. Draper’s Solar Control Solutions, including the FlexLouver, also work well when placed on the exterior, and used in conjunction with interior shading systems. For more information on Draper’s FlexLouver Rack Arm Systems, go to www.draperinc.com/go/FlexLouver.htm.